The DCM PT15 was designed to provide a cost effective solution for Appliance Controls. The combination of a PT15/PS15 control potentiometer with a Detent Control Mechanism (DCM) affords the appliance designer the possibility to solder the potentiometer onto the Control PCB assembly and then, in a second operation, assemble the DCM over it. This removes the need to build Detents into the User front panel of the appliance, simplifying, and significantly reducing the total cost of the solution. The potentiometer + detent mechanism + shaft can be delivered pre-assembled thus saving time and operations. The detent torque can be modified according to customers´requirements (depending on the input dial’s diameter, etc) as can the number and position of the detents. Combine this product with the ST-15 endless potentiometer and get a 360º cost-effective control. • High & low torque detents can be freely mixed. • Cut track option (initial / final). • Detents configurable to specific positions in complex tapers. • Designed for PT15V or PS15 (SMD). • Wiper positioned at initial, 50% or fully clockwise. • Resistive track dust proof enclosed. • Up to 16 high torque detents. Detents's torque can be customised. - Self extinguishable plastic UL 94V-0. - Wiper positioned at 50% or fully clockwise. - Special Tapers with non-overlapping values. Detents number: up to 16 (others: check availability). Rotary potentiometer switch program selector for white goods. HVACR selector switch in automotive. Air flow distribution selector switch. Selector switch for wall mounting fans. Selector rotary switch for coolers. Rotary switch for washing machines. 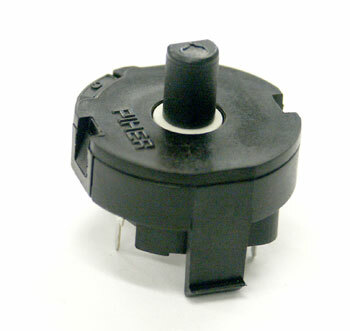 Selector rotary switch for fans, mixers, ginders.